I have set out to plant a long run of Australian native plants along one boarder of our property, both to provide screening from the neighbours and to allow a safe corridor through which (with any luck) native animals, reptiles and birds can cross our land. I have been looking at local parks and express-way nature strips for inspiration, as well as regularly browsing around the fantastic Wariapendi Nursery. Our strip of Australian natives hasn’t started off looking too appealing. 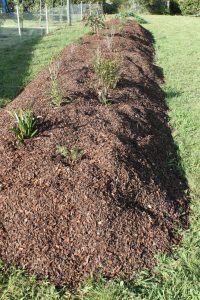 Many natives require good drainage and it seems that the usual way for achieving this is to plant them on a mound, so that excess water can run off. This fits in well with my screening requirements (raising up the ground cover and smaller plants to help block sight and sound), and so I have moved a lot of dirt into a 2 metre wide mound down the length of the boarder. Much of the dirt and composting matter came from the old soil and grass that I dug out when planting new lawn last autumn. I probably should have left the mound of dirt, lawn and garden rakings to compost down for longer, but I was super keen to get some natives in the ground, so I went on an initial buying spree in late spring. As I want the native strip to be a mix of plants (hopefully appealing to the maximum number of native animals and birds), I didn’t set out with a particular shopping list in mind. My plan is to include the greatest mix of plants I can (although keeping to those I find appealing) and just see which ones do well. Once I know what grows best, I will narrow it down to a more uniform collection of plants, and replace those that are struggling (or dead). Our Eucalyptus Summer Red looking decidedly unwell. I intend to use plenty of Australian native screening plants, but also a mix of other natives, including grasses, shrubs and trees. We also want to put in some bush-tucker edible varieties. 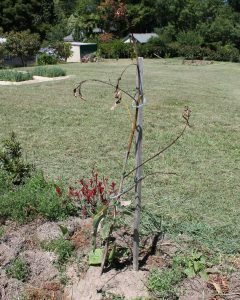 So far, I have planted: two bottle-brush Clearview Whites (Callistemon x hybridia), three bottle-brush Purple Prides (Callistemon x spp. ), a Eucalyptus Summer Red (a grafted, hybrid eucalypt), a Banksia (the old man gnarly type), a Mountain Pepper (Tasmannia laceolata), a couple of Mini Ha Ha (Hardenbergia Violacea), a Scented Paper Bark (Melaleuca squarrosa), a Dwarf Form (this was the name on the card, but sounds more like a description) (Baeckea virgata), and a couple of Snowmans (Kunzea ericoides). For two days after I put these plants in, we were hit by a strong relentless hot wind. I then had to go away for a few days and couldn’t water the young plants. As a result, the leaves on the eucalyptus have all gone brown and it is looking decidedly dead. Most of the other plants are also looking poorly and some far healthier looking weeds have started to spring up. Let’s hope things improve! Not to be perturbed, I have picked up a few new natives (at various times, as the fancy took me, from local markets and nurseries and even a couple from Wesfarmers’ big green shed). The new additions include another Banksia (Banksia serrata), a lemon myrtle, a shady lady white waratah, a confusingly named fan-flower (Scaevola) and an even more confusingly named Star Struck (hybrid Philotheca). 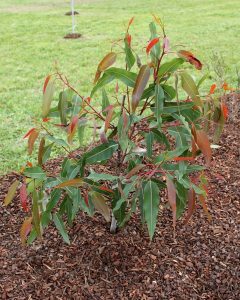 After a difficult start, our Eucalyptus Summer Red has bounded back to life. Of the original plants, the best performing has surprisingly been the Eucalyptus (Summer Red), tales of whose death had been entirely premature. Its original leader (which had been 1.5 metres and carefully staked by me) has indeed died from about 30cm off the ground upwards, but at that point we now have several new shoots, covered with healthy looking leaves. Serendipitously, the new shoots look like they will perform a far better job of screening, than the original single leader would have done. The tree looks like it will now be shorter and bushier, which should do the job perfectly. Unfortunately, many of the other plants have done less well. The original old man banksia is dead, and half the bottle brushes are also dried out husks. Also, most of the low lying ground cover shrubs are missing in action beneath the weeds, and presumably dead. Unfortunately, those weeds are really starting to take over! Mulching our strip of Australian natives. Having built the mound from old lawn and soil from around the garden, I shouldn’t have been surprised by the number of weeds that proceeded to spring up, but I was… the whole mound rapidly became a lush, green mountain of thriving weeds, shading-out and strangling the natives I had planted. An extreme response was required. Our strip of young Australian native plants. 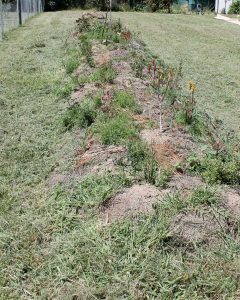 Once I had accepted that there was no way the natives were going to win through, I first set out with my shears, cutting the weeds down to near ground level (and accidentally loping the top off the nice waratah in the process). 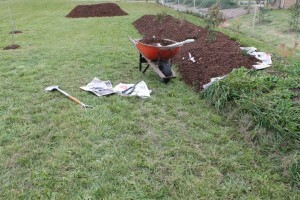 I then had 3 cubic metres of screened pine bark mulch delivered and went to work with newspaper and the mulch. I pulled up the remains of the larger weeds, leaving them on the mound, but with their roots out of the earth. I then meticulously covered every inch of ground with 4 or 5 sheets of overlapping newspaper, then shovelled on about 100mm of the mulch. The results look fantastic, but only time will tell if the weeds will manage to break through the newspaper and mulch, and attempt another takeover.